Olympian Roberto Pavoni secured his fifth consecutive British title in the 400m individual medley event with a dominant display in Glasgow. Pavoni, 23, finished in a personal-best time of four minutes 12.24 seconds, inside the qualification standard for England's Commonwealth Games team. James Guy followed up Thursday's 400m freestyle victory with gold over 200m. Rachael Kelly beat Siobhan-Marie O'Connor and Francesca Halsall in the women's 100m butterfly. 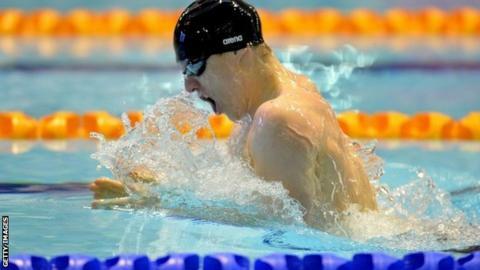 The British Championships, which present the final opportunity for swimmers to secure their place at the Commonwealths, are taking place at Tollcross, Glasgow - the venue for swimming this summer. Pavoni finished seventh at the Delhi Games in 2010 after becoming one of several swimmers to succumb to illness in India. However, after clocking the new English record and second quickest time for a Commonwealth swimmer this year, he is confident he can challenge for the podium this summer. "I haven't done a personal best in that event since 2012, so it's a massive confidence boost," Pavoni told BBC Sport. "I like this pool and hopefully even though I'm English, the crowd can give me a good cheer when I race this summer." Guy, 18, set a new British record over 400m on Thursday and admitted returning for another intense race 24 hours later may have been behind his failure to secure an automatic place on the England team. "I would have liked to have swum quicker tonight, but I was a little tired and after all that racing I'm relatively pleased because I think it will be enough [for a Commonwealth berth]," said, Guy who was just over a second off the required time. Kelly, 20, produced the surprise of the night by seeing off the challenge of established international swimmers O'Connor and Halsall to win the 100m butterfly in 58.40 seconds. "I came into the competition thinking I would come second to Fran [Halsall] so it feels absolutely amazing," said Kelly, who edged out O'Connor by 0.02 secs. Two-time world champion Liam Tancock faces an anxious wait to learn if he will be allowed to defend his 100m backstroke Commonwealth crown after finishing second to Chris Walker-Hebborn. Tancock's time of 54.51 was outside the English Commonwealth mark, as was Walker-Hebborn's effort of 53.82, but that should be enough to secure him at least a place in the medley relay line-up. Ben Proud secured gold over 50m butterfly for the second year in a row, whilst Sophie Taylor won her maiden British title in the 50m breaststroke event. However, both English swimmers will need to perform over their respective 100m distances later in the competition to be guaranteed places in the English team. In the evening's only multi-classification event, Paralympian Stephanie Slater claimed gold in the 100m freestyle, securing her place in the England team in one of only a handful of disability races included in the Glasgow programme. England's Adam Peaty qualified quickest for Saturday's 100m breaststroke final in an impressive 59.83, with Scottish duo Ross Murdoch and Michael Jamieson close behind.